Most shoppers seem to view visiting a franchised auto dealer to negotiate the purchase or lease of a new car with a distinct lack of enthusiasm. In fact, as electric-car driver Douglas Kerr notes, the process is often compared to having a cavity filled. Kerr has now leased or bought four separate electric cars, and he has some advice on reducing the pain. What follows are his words, lightly edited by Green Car Reports for clarity and style. My first experience in buying a car was epic. It ended with the salesman rising up from his chair and pointing at me, saying I was (kitty) whipped by my wife, and that I was a son of a (gun) who didn’t know a (friggin’) deal when I (friggin’) saw it. What followed was a continuing trail of expletives that would have made a sailor blanch. The salesman was irate because—after 45 minutes of back and forth between him, my wife, and me and endless treks to his sales manager—I hadn't signed on the dotted line. After a pause, I thanked him for his time, and said I would certainly get back to him if his deal was, in fact, the best available. As I sat stunned at this tsunami of invectives, my wife was already out the door and headed for our old car. I, ever the pragmatic one, headed for the sales manager’s office. I coolly explained what had occurred, and asked if the deal was still good if I could find no better. As it turned out, I did not find a better deal. The salesman, however, not only failed to get a commission from us, he lost his job: The sales manager fired him. As the years (and cars) went by, I've honed my methodology of car purchasing to a razors edge. 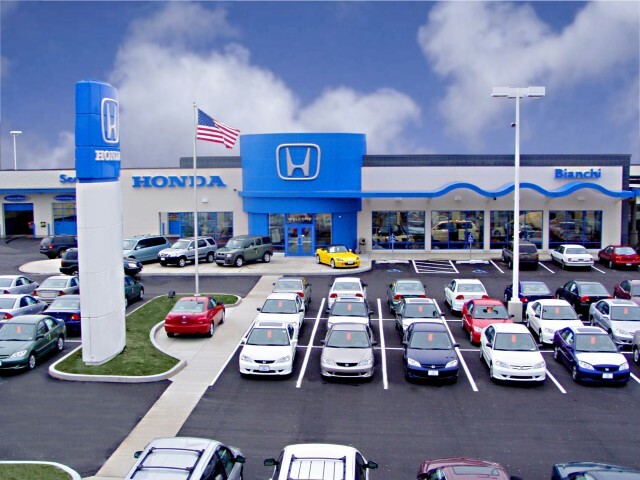 A Honda dealership in Erie, Penn. No longer did I visit the showroom floors at dealerships. Instead, I would find the fleet-car manager (now known as the Internet Sales Manager) and haggle using the dealer's own invoice price and the “best” price from internet car buying services. What had once been the sole province of Consumer Reports was now supplemented by TrueCar, Costco, Walmart, AAA, and a myriad of other services at my disposal. Then electric cars showed up, and my carefully crafted buying tactics were upended. When I decided to get my first electric car in 2014, there were very few practical choices: two, maybe three. The prices were high, and the deals were few. Leasing seemed to be a better alternative—but I had never leased a car. I was confused, uneducated, and devoid of any superior buying methodology. What were “capitalized cost reduction,” “residual value” and “acquisition fees?” Then there were considerations for mileage and "excessive wear," items I could control only to some extent. Leasing a car rather than purchasing has several negatives. Mileage limitations are a major impediment for those who drive a lot. Concerns about excessive wear are valid. I used to keep a car for 8 to 10 years; but you can’t do that with an electric-car lease—though not because EVs are inherently incapable of lasting 10 years. Many electric-car batteries can be expected to last beyond 100,000 miles, and the maintenance on battery-electric vehicles is demonstrably lower than that of their gasoline counterparts. But leasing is the better option because resale prices today are dismal, in part because battery technology improves every year. 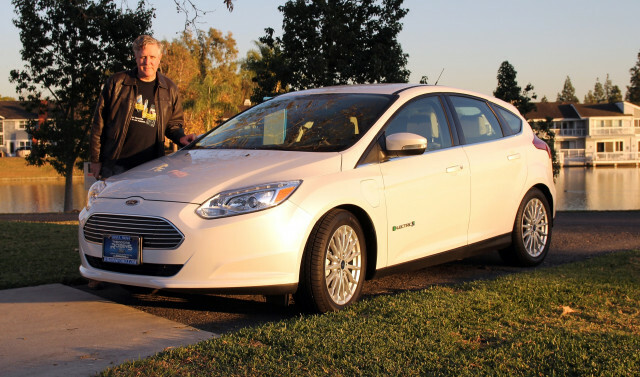 In the early years, electric-car leases offered a high residual value to lower the monthly lease payment. The "residual" is the predicted value at the end of the lease, and what you would pay if you want to buy the car when the lease ends. 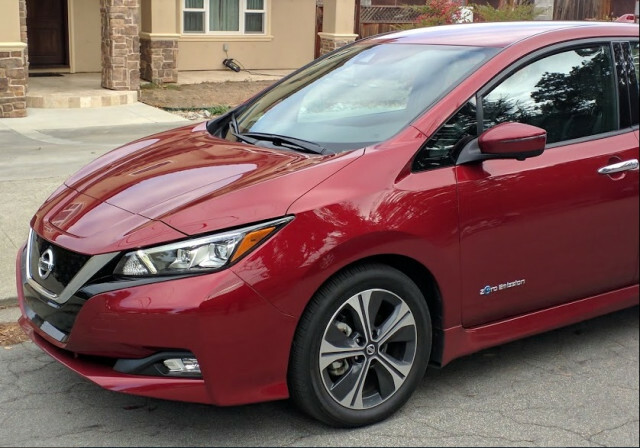 Buying an electric car is a lot simpler than leasing: If you don’t mind the poor resale values and plan to keep your EV for many years, purchasing is as easy as using a buying service for the car of your choice and coming up with the lowest quote. Then, find five or so dealers in your area, and make an offer—by phone or email only, no visit yet—to the internet manager of the one furthest away for a few thousand dollars below the lowest quote from a buying service. Negotiate that dealer's lowest price from there, then see if the dealers closer to you will beat that offer. You may end up with a lower price from a dealer closest to you. But ... negotiating a lease for an electric car is something else altogether. I've done it four times in four years, all in California. The best place to start is a website that compares lease deals on the car(s) you're interested in. I found the best and most up-to-date plug-in electric-car lease listings on a small site maintained by "an early adopter." That page provides an astounding amount of information, and its owner updates the information weekly. Note that the numbers used on the site for comparison are before tax—and, often a dealer will add additional fees. 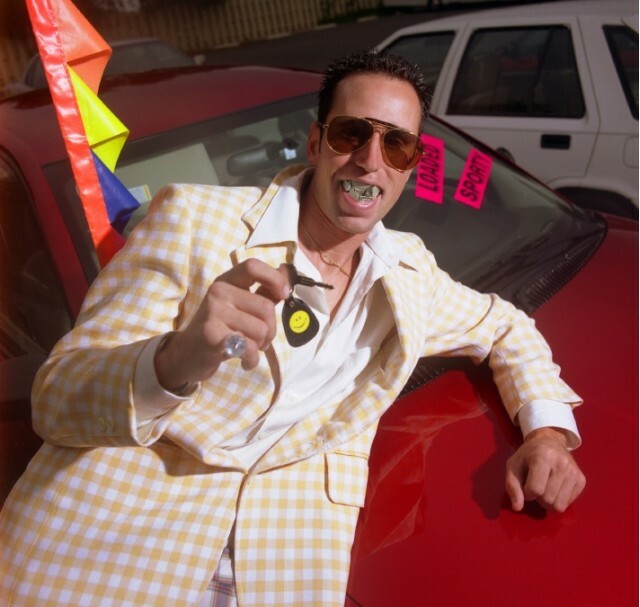 When I first started calling dealers to discuss leasing, I was stunned to find out the numbers advertised were far, far lower than the actual, final lease cost per month. The dealer would tell me the base lease and the down payment didn’t include taxes. Okay, fine. The numbers still didn’t add up, though. I found later on that dealers may also include an “acquisition fee” and “registration fees” and “document processing charges” and so on and so on. Then I had to learn that rebates and credits are subject to sales tax. 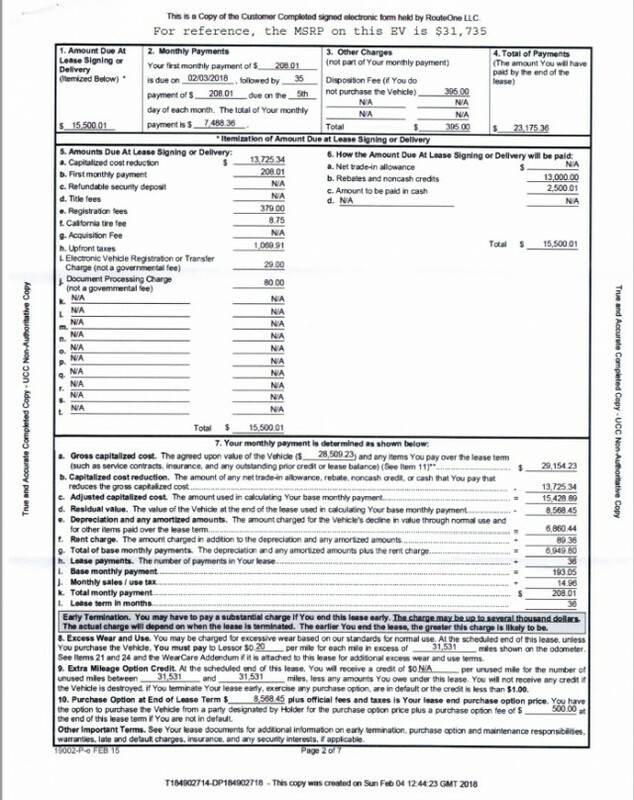 As my lease page shows, the “upfront taxes” are $1,069.91. Why is this number so high? Because my federal, state, and manufacturer incentives—both purchase rebates and “noncash credits”—come to a total of $13,000, taxed at 7.75 percent (your taxes will vary). To find out what incentives are available for you, Plug In America offers an easy to use map at State & Federal Incentives - Plug In America. 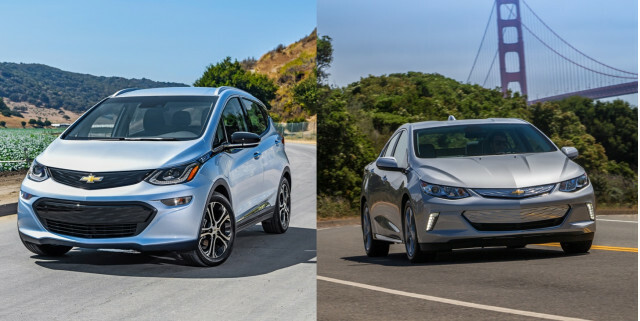 While someone who leases an electric car isn't eligible for the $7,500 federal income-tax credit, automakers usually (but not always) pass all or most of this amount to the buyer to lower the lease payment. Granted, you could school yourself in the intricacies of lease computation, as described on LeaseHackr, and learn how to calculate lease payments by hand. That requires educating yourself on money factors, depreciation, finance charges, and much more. If you’re into that kind of thing, you have my admiration. My alternative is simply to ask the dealership internet manager what my total lease payment will be, including taxes, registration, and fees. They call it the “out-the-door" number. If the salesperson can't plug in the numbers and give you the final figures you'd be committing to, leave and go elsewhere. After a few dealer experiences, you'll get a good idea of the deals that go beyond what the automaker offers, and often beyond what the dealer will advertise to the public. Most recently, when I got down to the lowest lease price from the furthest dealer, I simply called the others to see if they could beat $205 per month on a 36-month lease covering 10,500 miles a year with a $2,500 down payment. Fortunately for us, most electric cars have relatively simple pricing and limited trim levels and options. That lets you simply refer to an "SEL" or an "ES" or a "Platinum" trim level, rather than getting stuck in the weeds over the recommended sticker price may be on any particular model. If you want a particular option package—always get DC fast charging if it's not standard, for instance—ask for the lease price including that added cost, rather than a specific MSRP. 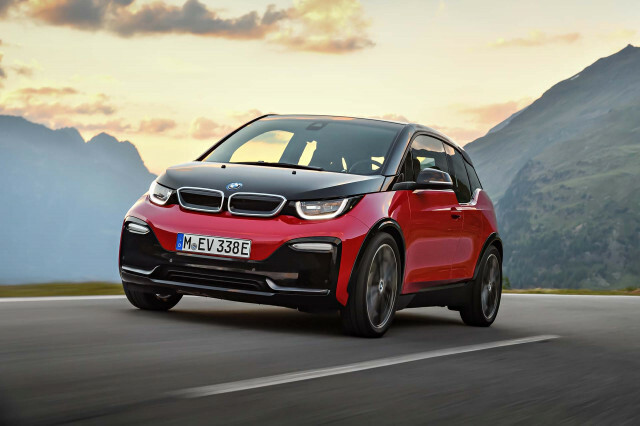 As noted above, residual value makes a big difference if you think you may want the option to purchase the electric car at the end of the lease you're negotiating. As my earlier sample lease page shows, the purchase option on the lease is $8,568 plus a $500 fee at lease end. Note that residual is often not negotiable—especially with Ford. Depending on the maximum annual mileage you agree to, the residual will change: The more miles, the lower the residual. Of course, if you want more miles each year in your lease, it will cost you more. But the residual will be the key to deciding if you want to lease or purchase. After all, if the two numbers end up relatively equal, leasing is the better choice—because batteries will likely be better three years hence. The table above does not calculate any loan interest paid for three years if the buyer gets a new-car loan; it assumes an all-cash payment. If you live in California (and some other states), both purchases and leases are eligible for state rebates. In California, if you make less than $36,180 in single income, or below $61,260 with three in your household, you are eligible for an additional $2,000 rebate. If you cannot take advantage of the federal credit because your income is too low to qualify, leasing may be the better option for you because the leasing company can take advantage of the full $7,500 credit to lower lease payments. As my experience has demonstrated, leasing an electric car may cost less over three years than buying the car outright. This is possible even if you expect to exceed the number of miles in the lease agreement. If you plan to buy the car at the end of the lease, you don’t have to worry about the mileage maximum—and it’s your car from the beginning. If you keep it simple, and don’t get bogged down in the lease minutia, a lease negotiation need not be intimidating. 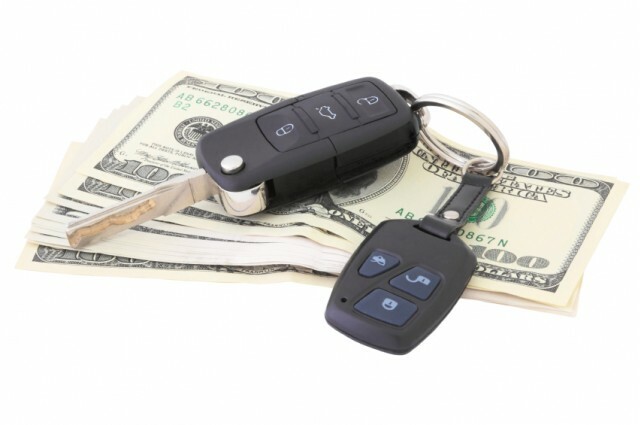 Make the dealer do the work in calculating your "out-the-door" lease payments. All you need to do is to pit dealers against each other starting with that first quote.